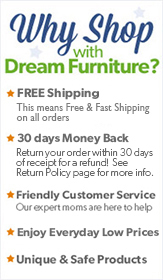 We will ship your order using the fastest and safest way possible. When your order ships you will be notified by email. The shipping confirmation email will have detailed information about the shipment, including the tracking number of your shipment. You can track your shipment directly from the My Account section of the website or through the shipping carrier. Shipping is based on the size and weight of the item. We offer two methods of delivery. All smaller and lighter items will be shipped by FedEx / UPS and all larger and heavier items will be shipped by Truck freight delivery. Standard Ground shipping is available and can be selected on the checkout page. Transit time for ground delivery will take 4-7 business days. Standard freight delivery is available and can be selected on the checkout page. Delivery is estimated to take between 7 to 10 business days. Service includes one-person ground level delivery outside the residence. Delivery appointments will be scheduled, with a four-hour window, between 8 a.m. to 6 p.m. local time, Monday through Friday. Please make sure you are available during the scheduled delivery hours. Note: Please call us if you would like expedited or White glove freight delivery service.